This tour covers all the tiger reserves of Madhya Pradesh and is ideal for a wildlife enthusiast not wanting to miss out anything. 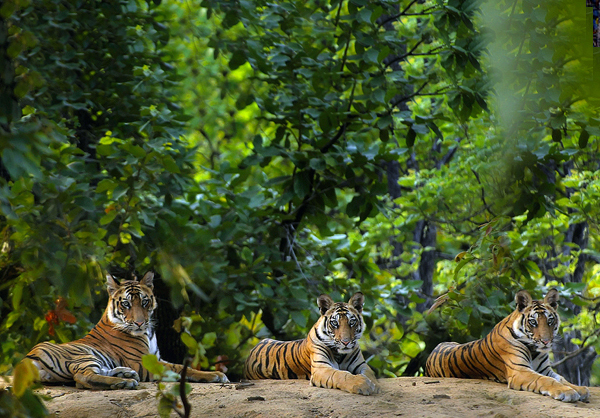 This tour covers Panna - Bandhavgarh - Kanha - Pench – Satpura spreading the complete length & breadth of the state. This is a holistic wildlife experience offering the very best of Central India. Denwa Backwater Escape is located overlooking the mesmerizing backwaters of a dam built on Denwa River in Satpura National Park, the area is popularly known as Madhai. It is built on 10 acres of forested land along the river and across the river is the national park which is approached by a boat and then by jeeps to go deeper into forest. The lodge offers stunning views of the Denwa River, grasslands across and rolling Pachmari hills. Day 01: Panna National Park Reach Khajuraho by train/flight. Half day temple visit with lunch at Khajuraho. Transfer to Panna (30 kms) dinner and overnight stay Ken River Lodge. Day 03: Panna National Park Morning and evening jeep safari in Panna Tiger Reserve. Breakfast followed by transfer to Bandhavgarh Tiger Reserve (5hrs) for lunch. Evening at Leisure followed by an early dinner. Day 06: Bandhavgarh National Park Morning and evening jeep safari in Bandhavgarh Tiger Reserve. Day 07: Bandhavgarh - Kanha National Park After breakfast depart for Kanha Tiger Reserve (5 hours) for lunch. Evening village visit. Day 08: Kanha National Park Morning and evening Jeep safari in Kanha Tiger Reserve. Day 09: Kanha National Park Morning and evening Jeep safari in Kanha Tiger Reserve. Day 10: Kanha - Pench National Park After breakfast drive to Pench Tiger Reserve (3 Hours) for lunch. Evening spend time at the in house organic vegetable & herb garden. Day 11: Pench National Park Morning and evening Jeep Safari in Pench Tiger Reserve. Day 12: Pench National Park Morning and evening Jeep Safari in Pench Tiger Reserve. Day 13 : Pench – Satpura National Park Early breakfast followed by transfer Satpura National Park (5 Hrs). Lunch on arrival at the lodge. Evening at leisure followed by an early dinner. Day 14: Satpura National Park Morning jeep safari. Afternoon boat safari Late evening jeep safari in the buffer zone to spot nocturnal wildlife. Day 15: Satpura National Park Morning jeep safari. Evening walking safari in the Satpura Tiger Reserve. Day 16: Satpura National Park Post breakfast, transfer for further connections. Tour cost: USD 3095 per person on twin sharing. Four shared jeep safari in Panna National Park with entry fees, jeep charges and guide charges included. Two shared jeep safari, one elephant or walking safari, one boat safari in Satpura National Park & one late evening buffer safari by jeep.